Come on now, this is the Vette of all Corvettes. 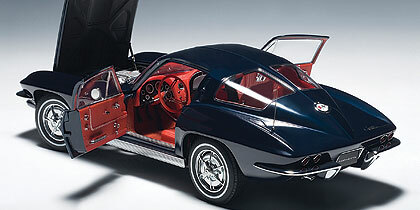 Autoart has kicked out a gorgeous rendition of the 1963 Corvette Sting Ray coupe, and in Daytona Blue no less. 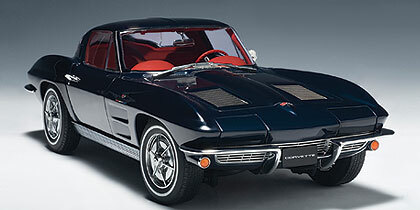 This was an iconic year for Corvette as 1963 was the first year of the second generation Vette, known as the C2. Its sleek and pointed shape made it seem futuristic and both the convertible and coupe models sold like, well like down parkas in Alaska. Famed Corvette designer Larry Shinoda was responsible for melding designs based off GM design chief Bill Mitchell’s 1959 Stingray race car and the 1961 concept Mako Shark. In addition, this was the first year for a coupe, which made it especially popular right off the assembly line. Overall 10,594 coupes and 10,919 convertibles were made and only 3,475 Vettes were painted Daytona Blue like this one. Autoart is making just 6,000 of this model, ironically nearly double the original. 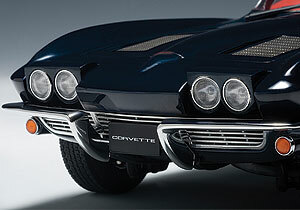 This Vette’s most notable design element is the split rear window, which went away in later versions of the C2. So it was a one-year styling wonder, making the car much more collectible, no matter the scale. Cost of admission in 1963 was $4,257 for the coupe, but today one will go for $65,000 to $100,000, based on condition and how many parts are original or matching numbers. Performance: Autoart’s rendition is beautiful bathed in a dark metallic blue, almost black paint job. As you’d expect in a well-detailed 1:18 model, the doors and hood fully open to reveal a high-level of detailing inside and under that long hood. There are chrome door handles and locks, chromed window trim and chromed front bumper and photo-etched grill inserts under those front half bumpers. The hide-away headlights are manually opened with a finger, but they move simultaneously and the hood features etched faux hood vents too. How many die-cast models feature true roll-away headlights that look this good? The rear deck features an etched Corvette Sting Ray logo and the famous crossed flags logo on a chrome gas cap. Under those half rear bumpers are twin chrome-tipped tailpipes too. While the engine is nicely executed with some hoses, the headers and power steering unit look a bit too plastic for my taste. Still there is good detail to the 327 small block V8 and the underbody is realistic too, outside of the licensing label and limited edition number plate. 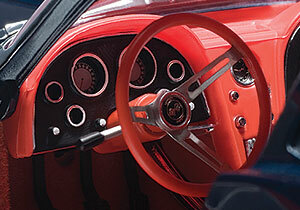 Inside, the Corvette’s aircraft like cockpit is attractive with good gauges and shifter, including a round black ball shifter knob. There are chrome window cranks for the main, and vent, windows, plus the steering wheel’s well executed three-spoke chrome hub and the wheel actually turns the car’s wheels. These look a little too shiny and plastic like, but do reflect (pardon the pun) the times. My only real disappointment inside is the lack of a grab bar on the passenger side, a unique item in its day. Die-cast Corvettes are so plentiful it’s hard to imagine not being able to find one for pennies. Yet this Autoart model is so chock full of detail that it justifies its price, sort of like an original Vette!